Teleflora's Spring Sweetness in Bonita Springs FL - Bonita Blooms Flower Shop, Inc.
Springtime marks a renewal of everything beauteous that nature has to offer; and this medley of pastel blossoms in tender hues of pink, blue and yellow would work well for a table centerpiece at a baby or engagement shower, or as a birthday bouquet. The pink glass cube vase is a lovely bonus gift. 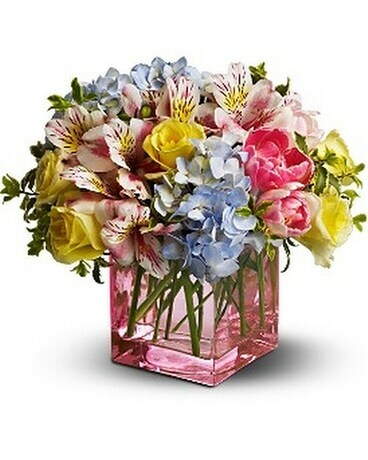 A mix of fresh flowers such as roses, tulips, hydrangea and alstroemeria – in shades of blue, pink and yellow – is delivered in a pink glass Teleflora cube vase.